• Africans were in the Americas centuries before Columbus and the “slave trade,” as shown by the research of scholars like Ivan van Sertima and Leo Weiner. Some evidence suggests an early African presence in Florida. 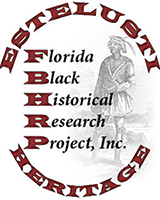 • Africans accompanied the first Spanish explorers and settlers of Florida, nearly a full century before the English settlement of Jamestown, Virginia. • While the Southern colonies, and later Southern states of the U.S., were dominated by plantation slavery, Florida was Spanish territory and “Freedom Land” for Africans escaping enslavement and Native peoples escaping settler encroachment on their traditional lands. • Pirates were known for exercising “complete integration and complete democracy.” Among the most legendary of pirates was Black Caesar, who operated in South Florida waters. • The first invasion of a foreign country by the U.S. began with the incursions into Florida which became known as the Seminole wars. • Both the words “Seminoles” and “Maroons” are derived from the Spanish word “cimarrones,” which was used for livestock which escaped into the wild. “Cimarrones” became “Siminoli” in the Creek Indian language, and then “Seminole” in English. • “The Seminoles were a people, not a tribe,” consisting of numerous Native groups and Africans. Black Seminoles were especially valuable to the alliance as interpreters, since they knew both European and Native languages. • The Seminole Wars were the costliest in U.S. history, in both money and bloodshed, until the Vietnam War. 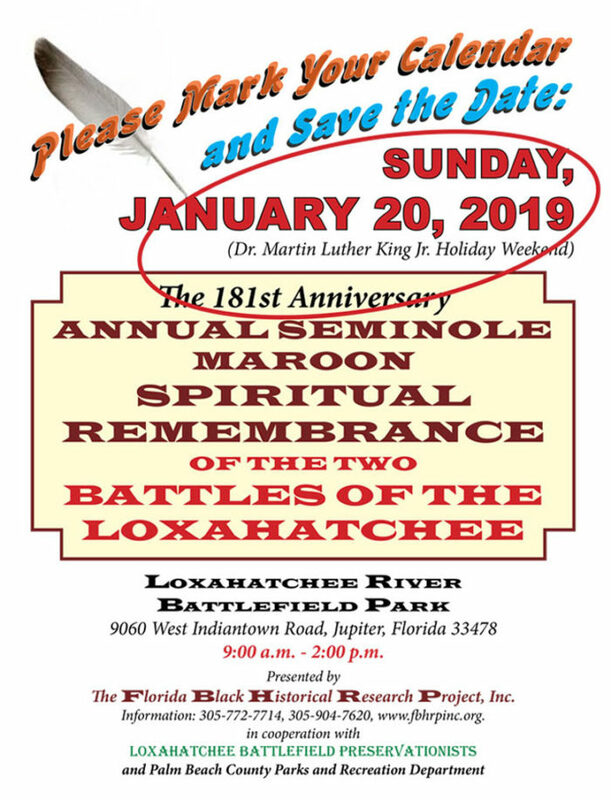 • The main goal of the Seminole Wars was not only to “fight Indians” and to displace them west of the Mississippi River on the Trail of Tears, but equally importantly to "recapture the 'property' " of Southern slave owners and prevent further escapes of enslaved people. • One of the most important sites of the Second Seminole War was the 1838 Loxahatchee River Battlefield in northern Palm Beach County, Florida, where Black and Native Seminoles, outnumbered and outgunned, fought bravely for their freedom, until they were captured by U.S. forces, dishonorably, under a flag of truce, and marched on the Trail of Tears to Tampa, shipped to Louisiana and east Texas, and marched to Oklahoma. The heartfelt gratitude and joy that we celebrate every year during this time are not diminished by the power of knowledge. On the contrary, like all human beings, we are only more empowered by knowing the history of the land that sustains us, and the human dramas which have shaped the world we know today. For this reason, this remembrance is included here as part of the FBHRP’s Mission. Links to further information follow this list. “Battle” of Washita, attack by U.S. forces on a Cheyenne Arapaho camp, led by Gen. Geo. A. Custer, in which principal Chief Black Kettle is killed, four years after the Sand Creek massacre (see Nov. 29, 1864, below). Sand Creek Massacre: On Nov. 29, 1864, as Union armies fought through Virginia and Georgia, Col. John Chivington led some 700 cavalry troops in an unprovoked attack on peaceful Cheyenne and Arapaho villagers at Sand Creek in Colorado. They murdered nearly 200 women, children and older men. Black Kettle had displayed an American flag to signal that they were “friendly,” but to no avail. Hanging of the youngest person in US history, Hannah Ocuish, described as a “half-breed Indian girl,” at age 12 years and 9 months, for allegedly murdering a 6-year-old white girl. Mankato Massacre: The largest mass execution in US history, takes place with the simultaneous hanging of 38 Dakota men (of 303 convicted, who rebelled against broken treaty promises and unlivable conditions) in Mankato, MN, by order of Abraham Lincoln. Wounded Knee Massacre, Pine Ridge Reservation, South Dakota: At least 200 killed, mostly women, elderly, and children,; 51 wounded, at Pine Ridge Reservation on South Dakota.